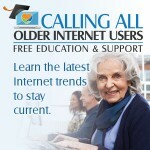 Are you an older adult already enjoying the benefits of staying socially engaged because of the Internet? Now is your chance to learn the latest Internet trends so that you don’t get left behind. We are offering a day of FREE workshops and everyone attending the event will be offered for FREE, up to one hour of online technical support within the 60-days following the event. Those wanting the FREE support will be required to install Skype (or other screen sharing software as requested by the Consultant) on their devices for the purpose of screen sharing. Please bring your Internet device with you to work with.